New Creature Creations curriculum is designed in such a way that it can be utilized in either the church setting or at home. Some possible uses include: Sunday School, Mid-week Bible Study, Summer Camp, VBS, Home School Sessions, or for Family Devotional Time. New Creature Creations (NCC) is an animated curriculum specifically designed to reach and teach kids with the Gospel of Christ. We believe God has designed us to be creative for His glory. In order for us to reach the generations to come, we must use new and exciting methods. Each of our lessons uses the Hook, Book, Look, Took format to engage children and clearly communicate deep biblical truths on a childlike level. 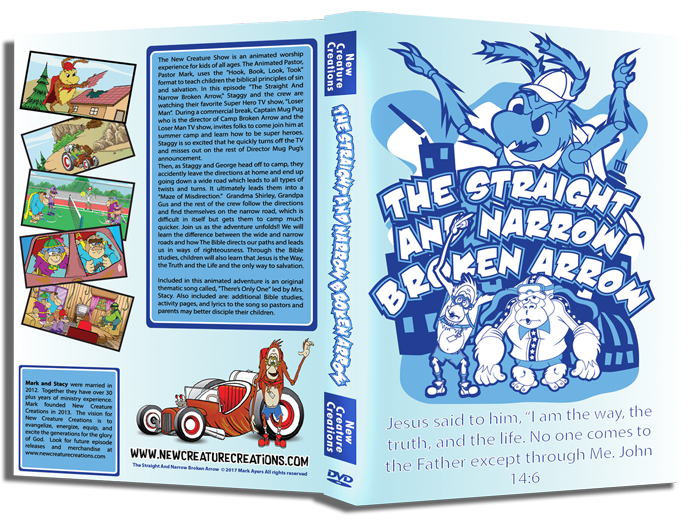 Our animated characters and their situations are used as the “Hook” to teach kids about the greatness of God. The ultimate goal of NCC is to evangelize, energize, equip, and excite the generations for the glory of God and each lesson seeks to teach God-centered truths that will help anchor kids in the Christian faith. During the first animated episode, children are introduced to Staggy, an Orangutan who is at the top of Needlepoint in search of a yuck, yuck berry. The sign beside the yuck, yuck tree reads: “Do not eat!” and of course, our hungry little monkey eats from the yuck, yuck tree and the adventure begins. Using the transition questions, parents and pastors can begin to relate Staggy’s adventure to the biblical realities of Adam and Eve’s fall into sin. Session two covers the truth that all of us have broken the holy standard of God and therefore are sinners. Many children believe that they are good or that we can be good enough to go to heaven and in session three they learn that no one is good except God alone. As fallen people, we cannot cover ourselves with our own good works. Session four focuses on the biblical understanding that we cannot rescue ourselves. God is the one who rescues us by sending Christ to save us. 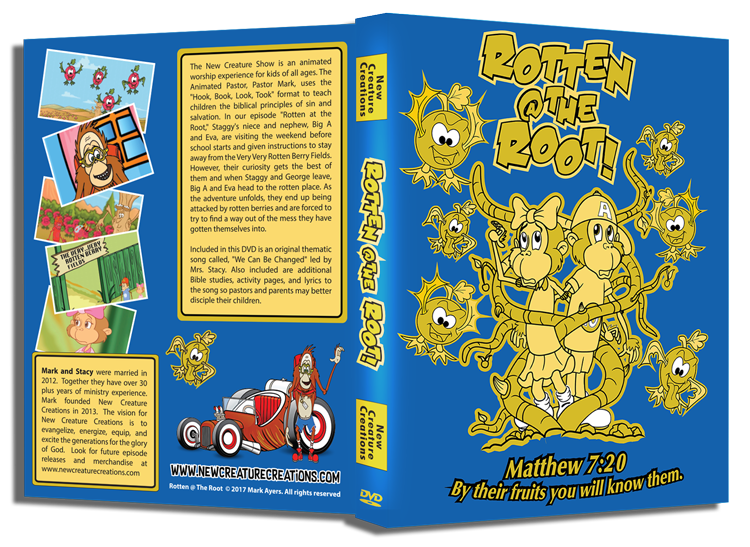 Our second episode, “Rotten @ The Root” is available for purchase from our website store. In this episode, Staggy’s niece and nephew, Big A and Eva, are visiting the weekend before school starts and given instructions to stay away from the Very Very Rotten Berry Fields. However, their curiosity gets the best of them and when Staggy and George leave, Big A and Eva head to the rotten place. As the adventure unfolds, they end up being attacked by rotten berries and are forced to try to find a way out of the mess they have gotten themselves into. During this Bible Study, children will discover what the Bible says about spiritual fruit. We are known by the fruits our lives produce. Our hearts are fruit factories. Men gather good fruit in good places. Good trees bear good fruit and bad trees bear bad fruit. Our hearts can either produce good fruit or bad fruit. A good heart will pro­duce good fruit and a bad heart will produce bad fruit. What’s in the root will come out in the fruit. God desires us to produce good fruit. However, WE cannot produce good fruit on our own. In the episode, “The Straight And Narrow Broken Arrow,” Staggy and the crew are watching their favorite Super Hero TV show, “Loser Man.” During a commercial break, Captain Mug Pug, the director of Camp Broken Arrow and the Loser Man TV show, invites folks to come join him at summer camp and learn how to be super heroes. Staggy is so excited that he quickly turns off the TV and misses out on the rest of Director Mug Pug’s announcement. As Staggy and George head off to camp, they accidently leave the directions to camp at home and end up going down a wide road that leads to all types of twists and turns and ultimately leading them to a “Maze of Misdirection.” Grandma Shirley, Grandpa Gus and the rest of the crew follow the directions and find themselves on the narrow road, which is difficult in itself but gets them to camp much faster. Join us as the adventure unfolds as we study about the wide and narrow road and how the Bible directs our paths and leads us in ways of righteousness. Pastors and parents, are you looking for an awesome children’s ministry outreach event? If you are, the New Creature Conference is for you! Our one-day kids’ conference is just the thing to scratch that itch. The New Creature Conference is a three hour conference for 1st through 4th grades from 9:00am-12:00pm. 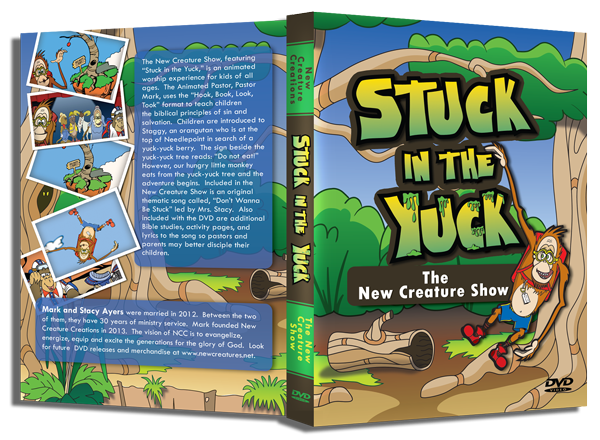 Children will spend the morning immersed in the gospel as the creator of New Creature Creations, Mark Ayers, uses his 25 years of ministry experience and his animated object lessons to share the gospel creatively with your children. During the high energetic opening assembly, children will watch an animated episode that is used as the hook for their small groups. Each participant of the conference will leave with the animated episode of the lesson covered that day. The New Creature Conference promises to be a fun, gospel-centered event for your entire ministry. Please contact us at thenewcreatureshow@gmail.com for pricing, conference contract and available dates. All episodes are written with leaders in mind, and come with a Leader Guides that provide four separate lessons to accompany each animation episode. The tools you need to help children learn key biblical principles. Curious about our curriculum? We’d love to hear your questions, and have the opportunity to show you how our curriculum can serve your family or church. Stuck in the Yuck © 2014 Mark Ayers. All rights reserved. Rotten @ the Root © 2017 Mark Ayers. All rights reserved.